News and Events | We Have Moved | "
We are excited to announce the release of our brand new disc which is out on the Albion Label. Please click below for full details. 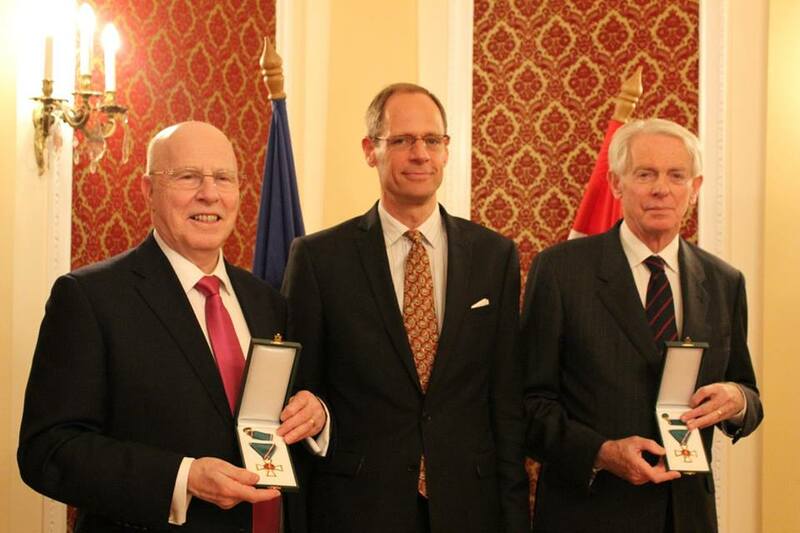 Peter Broadbent, conductor and founding director of the Joyful Company of Singers was awarded the Knight’s Cross of Merit of Hungary by President János Áder for promoting and strengthening British-Hungarian cultural relations. Peter Broadbent has been working tirelessly since the late 1970s to perform classical and contemporary Hungarian music to audiences across the UK and Europe. The prestigious award was presented to Peter Broadbent by Ambassador Péter Szabadhegy at the Embassy of Hungary in London on 19 January 2016 to coincide with the National Day of Hungarian Culture. Elaine Gould, an alto with the Joyful Company of Singers, has been Senior New Music Editor at Faber Music since 1987, in which capacity she has edited the complex and varied scores of many composers, including Jonathan Harvey. Recognised as a leader in the field, and a vital source of wit and common sense in JCOS rehearsals when we are wrangling new music, Elaine is author of the notation “bible” Behind Bars. That I am to fly off soon to celebrate the arrival of Jonathan’s manuscripts in Basel is a measure of the esteem in which his oeuvre is now held and a mark of the international recognition it has gained in recent years. The manuscripts will be housed at the Sacher Foundation Archive, alongside those of Stravinsky, Bartok, Ligeti and many great 20th-century composers, an acquisition that made Jonathan very happy at the end of his life, tragically cut short by Motor Neurone Disease last December. Jonathan was one of the most original of British composers, yet also very much European: a musician whose music did travel beyond our own shores, and there’s not so much that does. JCOS’s 1994 recording of Jonathan’s choral works was groundbreaking at the time, not to say an astonishing achievement on a mere 8 rehearsals! A measure of his growing reputation is that since that recording these wonderful choral works have been embraced by many European choirs (mostly professional) who have followed in our path with recordings of their own. For us in the choral world, Jonathan has left a legacy of extraordinary and original works. He is a unique composer in creating a body of innovative masterpieces also in the fields of instrumental and electronic music. His pioneering work with electronic music had studios round the world queuing up to invite him to create works and he relished their invitations (especially from those in sunny places). Ideas fed from one medium to another and he was always brimming over with ideas for new pieces, pushing at the boundaries of musical thought to create new soundworlds. His eyes would light up, ‘Ah, I have an idea for that!’ he would say in his quiet and modest way, while giving nothing away. He would also borrow from the old and the new: for instance, 17thC madrigal style and 1960s’ aleatoric counterpoint stand side by side in Forms. Imagine my surprise when, in 1998, this disciple of Stockhausen brought into the office his latest orchestral piece, Tranquil Abiding. ‘Jonathan, you’ve written a piece in E flat major!’ His reply was ‘This is my pot boiler – I want to make Faber lots of money.’ And many performances there have been of this lovely work. Many living composers of concert music steer well clear of non-professional choirs, yet, as we witnessed on so many occasions, Jonathan would never miss an opportunity to hear us singing his pieces, even while at the same time writing his last big commission, Weltethos, for the Berlin Philharmonic. He loved live performance, and he loved the spirit and commitment of JCOS’s performances. Having edited Jonathan’s manuscripts for 25 years, I carefully packed them up for their final journey a few months back, reflecting that in all that time I had never persuaded dear Jonathan of the value of a pencil sharpener. Deciphering his hand became increasingly tricky, yet he knew exactly what he wanted. All of life was in those pieces – what fun we had imitating the animal sounds in Marahi – yet every rhythm and pitch had its place even if it did look somewhat (or extremely) vague on the page. There was never a cross word, even when, as a young editor, I might have been in big trouble when an unrevised set of instrumental parts was discovered at an ensemble’s final rehearsal – while the corrected set sat in our hire library. Jonathan spent the evening before the concert correcting the set by hand rather than make a fuss. How I wished he had! Jonathan was a truly remarkable man and a remarkable composer. He was modest about his own achievements, endlessly inquisitive and a man without cynicism. His mission was to evoke the spiritual in everything and he, too, was the rare spirit to many of us. 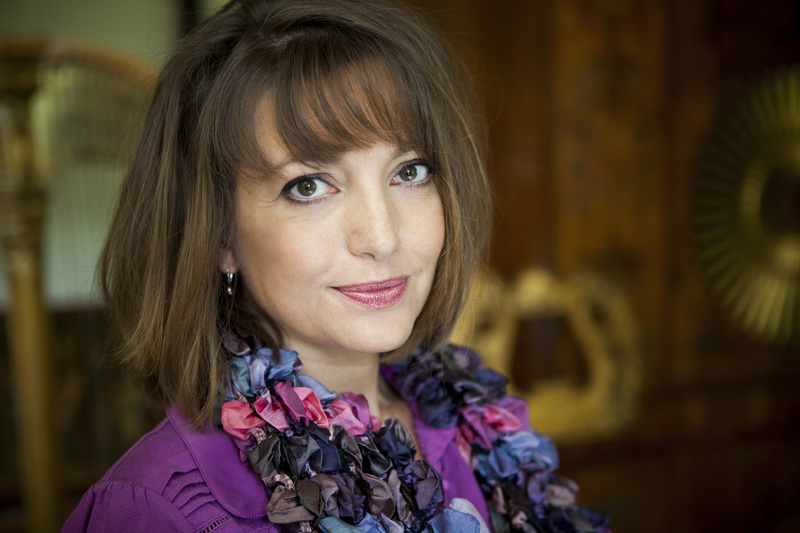 Roxanna Panufnik (born 24 April 1968 in London, UK) is a British composer of Polish heritage. She is the daughter of the composer and conductor Sir Andrzej Panufnik, whose centenary Joyful Company will help celebrate in 2014. Roxanna is currently one of the Vice Presidents of Joyful Company. Since studying composition at the Royal Academy of Music, Roxanna has written a wide range of pieces including opera, ballet, music theatre, choral works, chamber compositions and music for film and television. Among her most widely performed works are Westminster Mass, commissioned for Westminster Cathedral Choir on the occasion of Cardinal Hume’s 75th birthday; The Music Programme, an opera for Polish National Opera’s millennium season which received its UK premiere at the BOC Covent Garden Festival; and settings for solo voices and orchestra of Vikram Seth’s Beastly Tales – the first of which was commissioned by the BBC for Patricia Rozario and City of London Sinfonia. Joyful Company will be performing some of Roxanna’s work in the opening concert of the 25th season – more information can be found here. Michael Fitzhardinge Berkeley, Baron Berkeley of Knighton, CBE (born 29 May 1948) is a British composer and broadcaster on music. He currently serves as one of the Vice Presidents of Joyful Company. His father, Lennox Berkeley, was also a gifted composer and is well-represented within our repertoire, and his godfather was Benjamin Britten. With such an auspicious introduction to the musical world, it is perhaps no surprise that Michael’s gift for music was evident from an early age, and he was a chorister at Westminster Cathedral. His musical education continued at the Royal Academy of Music and later under Academy Award nominated composer Richard Rodney Bennett. In 1977, Michael was awarded the Guinness Prize for Composition, which was followed by his appointment as Associate Composer to the Scottish Chamber Orchestra in 1979. More recently, he was Composer-in-Association with the BBC National Orchestra of Wales from 2000 until 2009. Berkeley also acts as Visiting Professor in Composition at the Royal Welsh College of Music & Drama and was Artistic Director of the Cheltenham Music Festival from 1995 to 2004. Michael can be heard regularly on BBC Radio 3, presenting Private Passions, where he invites celebrities to share favourite pieces of music. More information on Michael can be found on his own website here. Robert Lucas Pearsall (the “de” he adopted in Germany was an affectation) was born in Bristol and embarked on a career in the Law. However he went to live in Germany, where he studied Renaissance music and became enthused with the idea of encouraging a renewed interest in Britain in the English Renaissance composers and their techniques. De Pearsall wrote many madrigals and part-songs but is probably best remembered for his arrangement of the carol In dulci jubilo and the eight-part madrigal Lay a Garland. The suspensions so beloved of the early madrigalists are a very obvious feature of this elegiac piece, set to words adapted from a Jacobean play. Giles Swayne is another composer whose gifts were apparent early in life, playing the piano at an early age and composing at the age of ten, encouraged by his cousin Elizabeth Maconchy. His Three Shakespeare Songs published while he was still a student at Cambridge show a remarkably assured technique and have featured regularly in the JCS repertoire since 1990. The JCS also premiered Two Romantic Songs at the Cheltenham Festival and gave the London premiere of his Stabat Mater. As Anthony Burton remarks in his percipient essay, “Giles Swayne occupies a highly individual position on the British musical scene. Out of alignment with the avant-garde, with minimalism and with diehard traditionalism, he still belongs anywhere but the middle of the road”. Swayne’s setting of the familiar text Ave, verum corpus contains typical rhythmic and harmonic devices, with the imitation and reiteration of the opening phrase adding to the intensity of this short piece. Gabriel Jackson is already one of the most recorded and performed composers of his generation. He is known principally for his choral music but that is only one part of his output. However, it was inevitable that writing for choirs should be a starting point, since he was a chorister at Canterbury Cathedral under Alan Wicks and singing great music in that great building was an inspiration for him. He too studied at the Royal College of Music, winning the R. O. Morris composition prize twice. Jackson has been Associate Composer to the BBC Singers since 2009. Cecilia Virgo was the first piece he wrote for the BBC Singers as long ago as 2000 and appropriately it received its premiere in Canterbury Cathedral in a programme featuring a great deal of English Renaissance music. It is a virtuoso piece, basically for 12-part choir, but with most parts divided into 6 at times. The imitative descending scales of the F major opening, the contrasting of men’s and women’s voices together with a beautiful section in D flat major for the sopranos before the return of the opening idea, are united by some complex rhythms which combine to make this a really celebratory piece for the patron saint of music. Salve Regina I (there is a more recent setting for the BBC Singers) was written for the choir of Truro Cathedral and first performed there in 2001. It is marked “Tenderly”, and that reflects the straightforward and lyrical approach to this hymn to the Mother of God – a brief Soprano solo leading to the final ecstatic “O Clemens, o pia…”. Salus Aeterna was commissioned by Oakham School, where it was given its first hearing in 2002. It is a lively piece, contrasting harmonised passages with plainsong-like unison but with constantly changing metres. There is a short reflective middle section but the rhythmic drive soon returns. To Music is a setting of a poem (described as a song) by Robert Herrick (1591-1674) and was written to a commission from the BBC to celebrate Stephen Cleobury’s 60th birthday in 2009. Once again it is marked by great rhythmical energy, mostly in 5/8 time until the final section “Fall down, down…” which has a steadier flow, leading to delightfully lush harmony for the closing passage. Sir Hubert Parry was something of a prodigy, being awarded his B.Mus. degree from Oxford University whilst he was still a schoolboy at Eton. Despite the best efforts of his family to channel him into a life of commerce (he was an underwriter at Lloyd’s for some years) and later his in-law’s objections, he eventually achieved a life in the musical world, teaching at the Royal College of Music alongside Stanford, becoming Director from 1895 until his death, as well as Professor of Music at Oxford University. I was glad was written for the coronation of Edward VII in 1902 and has been used at all subsequent coronations, as well as at the wedding of the Duke and Duchess of Cambridge in 2011. Blest pair of sirens, written in 1887, was the work which really established Parry’s international reputation. It is a setting of words taken from Milton’s At a solemn music and was first performed at the opening of the Albert Hall. The piece is dedicated to Stanford, who described Parry as “England’s greatest composer since Purcell”. In our latest recording for Naxos, the Joyful Company of Singers joined forces with the London Philharmonic Orchestra under the baton of Tom Martin to record Bottesini’s Requiem. Giovanni Bottesini (1822 – 1899, Italy) was best known as a double bass virtuoso and his modern-day counterpart, Tom Martin has put down his bow in favour of a conductor’s baton to record Bottesini’s compositions. In his review, The Classical Reviewer described JCS as being “on fine form” and a more in-depth review with an overview of the music can be found here.